Cranberry Satin is perfect for making apparel lining, pillow cases, formal wear such as skirts, and more. Bridal satin is an affordable, classy fabric with a pretty sheen. You have the color I need and a great price. I need a heavier weight, dark red satin to finish a quilt. This looks like it will do. 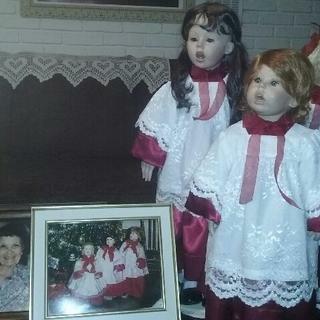 My mother passed away in May (age 92) and I inherited the caroler dolls she handmade many yrs ago. Making new choir robes for them so I can display them every Christmas as she did. This will be beautiful with a surplice made of the chantilly lace. Great Price and Color was what I was looking for and in-stock when I could not get locally in-store as it is "out of season"
I bought this fabric to line a Santa suit because it looks rich in color. I am making Christmas ornaments and satin will look lovely. Deep, rich, vibrant color. Not too dark, not too bright, and no hint of "pink" as is sometimes the case with choosing red fabrics. It looks very much like what you see in the photo. A perfect red. It matched a bed skirt that I already have and I want to make pillow shams. I'm making my granddaughter a wizard robe. The color will be perfect with a little gold trim. She loves to play dress up. I'm using this as apparel lining. 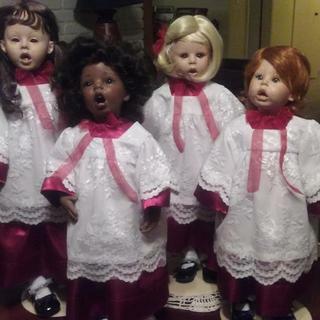 Last Christmas I made choir robes for the porcelain dolls my mother made in 1993. I ordered this cranberry satin and white Chantilly lace. The robes turned out beautiful! So glad I found this fabric company online! Absolutely beautiful! This has the tone and hand I was searching for.